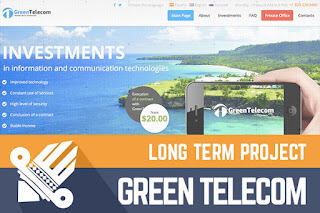 At Green Telecom I reinvested $400 nine days ago and at this moment it is listed on the Golden Stage listing. Administrator obviously aims for long-term cooperation and that is the reason why you can find this project here on DavidNews.com. The first thing that attracted me to Green Telecom is that main language for this project is Spanish, making it look different from other conventional investment projects. Of course, language localizations is nothing new, and many projects are translated into several languages, but this time also legend it connected to the Dominical Republic where the official language is Spanish. The company promotes that it is involved in IT and telecommunication sector, but as we know it solely relies on new investments and reinvestments. Besides great legend lies beautiful design and overall setup of the web page. Green Telecom is entirely from the scratch built project, and you will not find any other similar project in the industry at this moment. All of that mean just one thing - for this administrator, this isn't his first rodeo, and he is a professional one. Lately, in reviews, I do not cover investment plans because in most cases they are self-explanatory, but I like that some investment options are not available from time to time making realistic look for this project. Talking about investing there is one more thing that I would like to tell. I strongly recommend investing entirely with traditional payment options, such as Perfect Money, Payeer, Bitcoin and AdvCash and not to use VISA/Mastercard method. The reason for that is very simple - when you will try to add your card details an error with statement will pop up "You can pay only with cards from banks on the Dominican Republic." Of course, I do not think that there is any script that can identify is your card from the Dominican Republic or not, but at the same time, we can't know if Green Telecom saves details of your card or not. And if saves than we can't know how they will be used later, so - safety first. I have seen that this project is noticed by a big amount of promoters all around HYIP industry, and this fact speaks more than some beautiful words in the review. As I wrote earlier, I think that this project is here for the long run and if you decided to invest here remember that even the best promoted and best looking projects will close one say, so invest only funds that you can afford to lose. Investment plans: 0.9% up to 2.8% daily for 90 calendar days up to one year. Deposit activation within 48 hours. If you are searching for the ultimate Bitcoin exchange company, then you should use Coinbase. YoBit allows you to claim FREE COINS from over 100 different crypto-currencies, you complete a captcha once and claim as much as coins you can from the available offers. If you're looking to buy bitcoins online, PAXFUL is the ultimate source for bitcoins as it allows buying bitcoins by 100's of payment methods, such as MoneyGram, Western Union, PayPal, Credit Card and they even allow exchanging your gift cards for bitcoins.